Stop watching movies and TV shows according to Hollywood's schedule! With video-on-demand, you can watch TV whenever you want, wherever you want, and you don't even have to remember to program a box to record it. Here's MaximumPC's take on the major online VOD services available today. Amazon.com's online VOD store lets you rent or purchase TV shows and Hollywood movies. Most rented videos are streamed, although some can be fully downloaded to a TiVo DVR or Amazon's Unbox Video Player on a Windows PC. You can also purchase videos on one computer and download them to another. Downloaded content can be transferred to a limited number of handheld devices, but be aware that iPod support is not included. Amazon can also store your purchased videos on its servers. Amazon claims 90,000 titles in its library. You'll find Hollywood movies (available as soon as they hit DVD), as well as TV shows from the broadcast and cable networks, including Showtime and HBO (although you'll have to wait a while for HBO's programs to show up). Videos are streamed at the highest resolution your Internet connection supports, up to a maximum of 720p with a 3.5Mb/sec connection. The minimum supported speed is 450Kb/sec. Various TVs from Panasonic, Samsung, Sony, and Vizio; various Blu-ray players from Panasonic and Sony; TiVo DVRs; Roku media players; Google TV devices, such as the Logitech Revue; Mac or Windows PC (via a web browser). Newly released movies typically cost $3.99 to rent and $14.99 to purchase. Sale prices for older movies typically drop to $9.99 (rental prices remain the same), while some classics can be purchased for $4.99 or less, or rented for $2.99. TV shows are typically sold for $1.99 per episode (with discounts if you purchase entire seasons), but most HBO shows are available only for rental. Amazon doesn't charge a monthly fee, although subscribers to the company's Amazon Prime program ($79 per year) can stream (but not download) an unlimited number of movies and videos from a smaller library of 5,000 titles. Amazon offers great prices if you're interested in buying downloadable movies, and the option to store your purchases on their servers reduces your risk should you suffer an equipment failure at home. The ability to transfer rented movies to portable devices would be a great differentiator if the list of supported devices included anything relevant. Free video rentals is a great new benefit if you're already a Amazon Prime subscriber, but Amazon's library is too small to justify signing up for that service solely to get free video streaming. This is Blockbuster's attempt to transition its brick-and-mortar movie rental business into the 21st century. Rented videos are streamed, while purchased videos are downloaded to your Mac or Windows PC. The service is powered by Sonic Solutions's RoxioNow. You'll find VOD versions of movies just released to DVD, as well as a deep library of classic films available in resolutions up to 1080i. The service doesn't currently offer any TV shows for rental or purchase. Various TVs from Samsung and Vizio; various Blu-ray players from Onkyo, Philips, Samsung, and others; TiVo DVRs; various smartphones on AT&T, Sprint, T-Mobile, and Verizon; the Samsung Galaxy Tab on Verizon and the Dell Streak 7 on T-Mobile; networked media players from Western Digital and 2Wire; Microsoft Xbox 360 gaming console (requires a Windows PC connection); Windows PCs (via a Windows app; Macs aren't supported). Most new releases cost $3.99 to rent, or $19.99 to $21.99 to purchase. You can rent some older movies for as little as $1.99, but the service isn't competitive when it comes to selling most classics, with titles typically priced at $9.99 each. There are no subscription fees. Blockbuster took far too long to respond to Netflix's movies-by-mail strategy. Management's dawdling eventually bankrupted the company, and Dish Network recently bought Blockbuster's assets at auction. Blockbuster on Demand offers unparalleled device support, and the Dish Network acquisition means it's now relatively safe to purchase downloaded movies from this source (although we don't think it's wise to purchase any media that's encrypted with DRM (digital rights management) technology. Dish Network's management has not revealed its full Blockbuster strategy, but it did announce it would keep 600 Blockbuster brick-and-mortar stores open. Operated by Best Buy and powered by RoxioNow, CinemaNow is another VOD service that offers movies and TV episodes for rental or purchase. Regardless of whether you rent or buy, videos can be streamed for instant viewing, or downloaded and watched later (downloads can be shared between five devices). You can also use your smartphone to purchase content and have it downloaded to your Windows PC. This way, you can purchase a movie while you're at work, and it will be ready to watch when you get home. You'll find VOD versions of movies just released on disc, as well as a spotty selection TV shows from the broadcast and cable networks, including Showtime but not HBO. New TV episodes-of the select shows actually offered-are generally available the day after they're broadcast. Videos are streamed at the highest resolution (up to 1080p) that your Internet connection is capable of supporting. CinemaNow requires a minimum connection speed of 1.5Mb/sec. Various TVs from LG and Samsung; various Blu-ray players from Insignia (Best Buy's house brand), LG, Panasonic, and Samsung; Microsoft Xbox 360 gaming console (requires Windows PC connection); Mac or Windows PC (via browser). Most newly released movies can be rented for $3.99, while older movies rent for $2.99. Purchase prices for films range from $9.99 to $19.95, although most new releases were selling for $15.95 at press time. TV episodes sell for $1.99 each. There are no subscription fees. Best Buy offers very good prices for movie purchases, but its prices for movie rentals and TV episode purchases are only just meh. We like the ability to buy a movie with a smartphone and have it automatically downloaded to a PC-and it would be great if rentals could be arranged this way, too. For whatever reason, Best Buy has chosen to support far fewer devices than the RoxioNow service is capable of delivering (see Blockbuster on Demand for examples). Crackle describes itself as a multi-platform video entertainment network and studio owned by Sony Pictures Entertainment. The service is unique in that it enables you to share its original content with friends via email, embedded links, or posts to Facebook and Twitter. You'll find full-length feature films and TV episodes, as well as trailers for coming attractions. Sony owns most of this content, although Crackle does carry some Showtime TV shows. And unlike most of the other VOD sites, Crackle also produces some entirely original programming. Videos default to 360p resolution, which is lower than standard definition (480p). Crackle does offer some content at higher resolution, but it tops out at-you guessed it-480p. You can stream-but not download-Crackle's Flash videos to these connected devices: Bravia model TVs from Sony; various Sony Blu-ray players; TiVo DVRs; Sezmi set-top box; Google TV devices, such as the Logitech Revue; Hulu (and all networked media players that support that service); other media players, including D-Link's Boxee Box and Roku's devices; Sony PlayStation 3; Verizon FiOS TV; Android devices; mobile devices on Sprint T-Mobile, Verizon; Mac or Windows PC (via browser). Crackle is free on almost all devices, but it's definitely not free from advertising. If you do wish to buy or rent a video you're watching (and if it's approved for sale or rental), the video player will display links to online retailers such as Amazon and Apple's iTunes store, where you can complete the transaction. You'll also need to be at least 18 years old, and register with the site to access R-rated movies. If you're a Netflix subscriber, you've probably already seen most of the movies that Crackle has to offer-and without commercial interruptions. The low-res video is another bummer. Some of Crackle's original content is definitely worth watching, though, especially the female-assassin series Angel of Death. Crackle is a good choice if you enjoy watching videos on your mobile device, too, although we wouldn't pay the requested $6 monthly for the privilege. And while we applaud Crackle for enabling its customers to distribute its content relatively freely, bear in mind that it's primarily in the interest of promoting the service. Vudu started out as a movie-download service using a proprietary set-top box with an onboard hard drive. Besides the hardware-and a bevy of deals with movie studios-Vudu's biggest claim to fame is its HDX video-encoding algorithm that enables it to stream movies in full 1080p. The set-top box eventually fell by the wayside in favor of streaming movies to devices such as Blu-ray players. That removed a significant entry barrier for consumers, but it wasn't enough to keep Vudu independent, and Walmart acquired the company in early 2010. Vudu offers Hollywood movies for rental and sale typically the same day they become available on disc. Vudu recently began offering TV show episodes, too, including Weeds, Gossip Girl, and The Walking Dead. Videos are streamed at the highest resolution your Internet connection is capable of supporting, with standard-definition (480p) video requiring a minimum connection speed of 1Mb/sec. Vudu offers two high-definition streams: HD (720p) on a download speed of at least 2.25Mb/sec, and HDX (1080p, 24fps) on a minimum download speed of 4.5Mb/sec. Various TVs from LG, Mitsubishi, Panasonic, Philips, Samsung, Sanyo, Sharp, and Vizio; various Blu-ray players from LG, Magnavox, Oppo, Panasonic, Philips, Samsung, and Vizio; Sony PlayStation 3; D-Link Boxee Box; the Vudu box; a Mac or Windows PC (via Boxee app). Although the Vudu box is no longer actively marketed, it's still supported and you can find new units for sale at Amazon. Newly released movies cost $3.99 to rent and typically $14.99 to purchase. Most older movies cost $2.99 to rent and $9.99 to purchase. Vudu also has a broad collection of titles available to rent for $2.00, but these movies still cost $9.99 to purchase. TV episodes cost $1.99 for standard definition and between $2.49 and $2.99 for HD quality. Who'd have thought that Walmart would offer one of the best VOD services on the market? Vudu is at least as good as Amazon Instant Video, and it's much better than iTunes (for movies, at least). Walmart didn't conceive the technology, but its formidable clout should take Vudu to the next level. We hope Walmart doesn't give up on the Vudu box entirely (a company spokesperson insists it won't), because the ability to download movies in HDX format regardless of your Internet speed, is a great feature. Hulu is a content aggregator offering on-demand TV shows and movies from most of the major networks and movie studios. Hulu is the name of the free service, while Hulu Plus offers more features and is subscription based. Major players that own stakes in Hulu include NBC Universal (now merged with Comcast), News Corporation (owner of the Fox network), and Walt Disney Corporation (owner of ABC). CBS (which also owns Showtime and more) is the only major TV network that doesn't own a piece of Hulu. Most of Hulu's content consists of TV episodes, news programming, and a handful of feature films produced by the three major concerns with ownership stakes. TV shows typically appear the day after they're broadcast, and all this content is supported by advertisements, even if you spring for a Hulu Plus subscription. So what do you get if you subscribe? Higher-resolution video, for starters. Hulu content is streamed in "standard definition" (a term Hulu doesn't define), while Hulu Plus video streams in "high definition" (720p). And while basic Hulu is available only on a computer, Hulu Plus can be streamed to an increasingly wide range of devices. Also, basic Hulu delivers only the five most recent episodes of available TV series, whereas you get entire seasons on Hulu Plus. Movies generally aren't one of Hulu's strengths, but cineastes will revel in the Criterion Collection of films available on Hulu Plus. Criterion is renowned for both the impeccable quality of its film-to-video digital transfers and its supplemental material, including deleted scenes, audio commentaries, and more. This supplemental material isn't currently available on Hulu Plus, but it's slated for the future. Hulu is available on Mac, Linux, and Windows PCs, but you must be connected to the Internet to watch, and you can't download and store videos on your machine. Hulu Plus has the same restrictions, and, besides computers, is available on the following devices: various TVs from Samsung, Sony, and Vizio; various Blu-ray players from Samsung, Sony, and Vizio; Roku networked media players; Sony's Dash and Netbox; Sony PlayStation 3; and iOS devices (via an app). Hulu has also announced plans to deliver Hulu Plus on the following devices: various TVs and Blu-ray disc players from LG and Panasonic; TiVo Premiere DVRs; Western Digital's WD TV networked media players; Microsoft Xbox 360; and Android devices (via an app). Hulu is free. Hulu Plus costs $7.99 monthly. Videos on both services contain commercial advertising, and you'll need to register for whichever service you decide to use. We loathe commercials, but they're a reasonable trade-off for getting triple-A content for free. But having to pay for content and still be forced to watch commercials is something else. Hulu's free iteration delivers most of what you'll get on broadcast and subscription TV, so it could well satisfy your needs-provided you don't mind watching on a computer and don't fall too far behind in a TV series season. 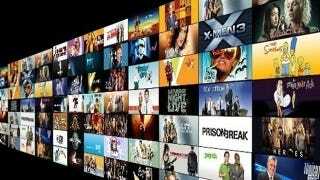 Hulu Plus offers a lot more content, and it's available on a host of devices that will connect directly to your TV. If you're looking to cut your ties to a pay TV service, it's definitely worth $7.99 per month-even with the commercials. Aside from the excellent Criterion Collection, however, Hulu Plus can't compete with the Netflix movie library. Available for both Mac and PC, Apple's free iTunes application lets you play, organize and purchase digital music and video. You can also use iTunes to transfer your video purchases to an iPod, iPad, or iPhone, or stream that content to all these devices, as well as the Apple TV media player. Whereas iTunes music downloads can only be purchased, movies and TV show episodes can be either purchased or rented. Apple's media store offers a comprehensive collection of Hollywood movies, plus TV shows from the major broadcast and cable networks, including Showtime and HBO. Many of the films include what Apple calls iTunes Extras: deleted scenes, making-of documentaries, music videos, and so on. Just be aware that iTunes Extras are viewable only on a computer or via Apple TV. Most movies and TV episodes are available in either standard or HD (480p and 720p, respectively). Unlike most of the other services discussed here, you can download both rented and purchased content to your computer or Apple device. You must watch rented movies and TV shows within 30 days of downloading. Additionally, you must finish watching a rented movie within 24 hours of clicking the Play button. You have 48 hours to finish watching rented TV shows. A TV connected to an Apple TV media player; most iPod models (HD content will require an iPod touch); iOS devices (HD content will require iPhone 4); Mac or Windows PC (via the iTunes software). To rent newly released movies, you're typically looking at $3.99 for standard-def, and $4.99 for HD. To buy that same content, you'll usually pay $14.99 and $19.99, respectively. Most TV shows sell for $1.99 for standard-def and $2.99 for HD. If Apple had its way, you'd only be able to watch iTunes content on Apple products. The company's almost there now, supporting Windows only because of its huge, dominating installed base. On the other hand, no VOD service but iTunes supports so many types of devices: computers, tablets, smartphones, digital media players, and networked streaming boxes. Of course, all of these devices must be Apple devices (aside from Windows PCs), but hey, that's capitalism. Won't someone please one-up Apple? Netflix started out renting DVDs by mail, but now emphasizes its subscription-based video-streaming service over renting physical discs. As a Netflix subscriber, you can stream as many movies and TV episodes as you like, but you can't download the videos to any device. You'll find Hollywood movies, TV episodes from broadcast and cable networks (including Showtime but not HBO), and original movies and TV series carried on the Starz cable network. Netflix boasts a high-quality back catalog of streaming content, but it takes a long time for new movies to become available for streaming, and TV episodes generally don't become available until after their seasons have been released on disc. Videos are streamed at the highest resolution your Internet connection can deliver, up to a maximum of 720p. Various HDTVs from LG, Panasonic, Samsung, Sony, and Vizio; various Blu-ray disc players from LG, Panasonic, Sony, Toshiba, and others; TiVo DVRs; most media players, including the Apple TV, Boxee Box, Google TV, Roku, and WD TV Live; PlayStation 3, Nintendo Wii, and Xbox 360; iOS devices (via an app); Mac or Windows PC (via web browser). A Netflix "Watch Instantly" account costs a minimum of $7.99 per month. This baseline plan doesn't include any physical disc rentals, but it also places no limit on the number of videos that you can stream. Of course, Netflix continues to offer plans that include physical disc rentals, and each throws in unlimited streaming as a value-add. Netflix says that the low pricing for its streaming-only plan reflects all the money it saves on disc postage, but how long will unlimited streaming range from free to $7.99? We say enjoy the killer pricing while you can, but get ready for a "correction" when physical discs are phased out altogether. Rumor has it that Hollywood secretly hates Netflix, fearing that the company will eventually dominate the post-theater, retail movie business in the same way that iTunes dominates the music business. Netflix has already tried to appease the studios by agreeing to not rent newly released discs until after they've been available at retail for 28 days. Regardless, we can recommend a Netflix streaming-only subscription for movies (though patience is key!). Hulu Plus is a far better service for TV content.